Grave marker for Cornelius C. Connaghan in Section 16, Block 8, Lot A, Space 7 of the South Lawn Memorial Cemetery, Tucson (Pima county), Arizona. 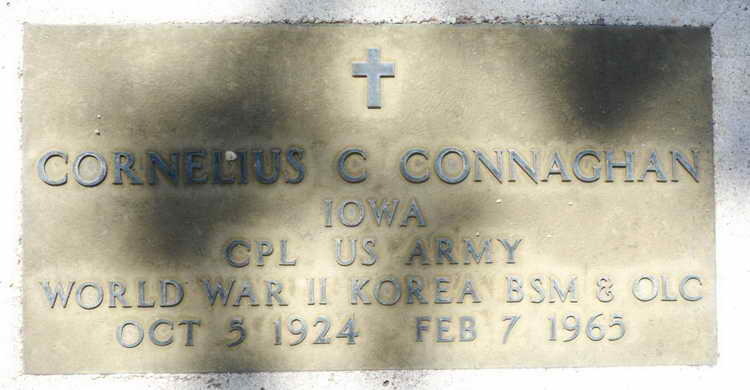 Although born in Illinois, his home state is listed as Iowa because that is where he first enlisted at Camp Dodge. Pvt Connaghan was listed as missing on 6 June 1944 but his status was later changed to POW. He was ultimately liberated from Stalag 4D on 24 May 1945. His grave marker inscription states that he received the Bronze Star Medal with 1 OLC, the awards were perhaps due to having a WWII CIB and then while he served in Korea.